AWI CEO Stuart McCullough at the Australian Sheep and Wool Show. AUSTRALIAN Wool Innovation chief executive Stuart McCullough’s claim that grower bodies arguing for a lower industry levy was partially responsible for the recent decline in wool prices have been rejected by growers, brokers and analysts. WoolProducers Australia chief executive officer Jo Hall has rejected AWI CEO Stuart McCullough’s suggestion that WPA’s campaign to drop the 2pc wool levy to 1.5pc was a call to reduce investment in marketing, research and development and was partially responsible for recent price drops. “I think some damage to the brand wool has already been done and prices are showing that already, with a few other issues that have happened. “I think there has been a huge amount of damage with the agri-political groups – WoolProducers and Australian Wool Growers Association — they’re pushing this signal out there that it is time to reduce investment in marketing and R&D; I think that’s done damage to brand wool,” he said. “And you think that’s responsible for the price drop that’s currently being experienced?” Mr Long asked. “I think that’s playing a part, absolutely playing a part, I haven’t seen a drop like this, some 300 cents, in a hell of a long time, in fact maybe in my lifetime in the wool industry,” Mr McCullough responded. Mr McCullough and his chairman have been lauding AWI marketing’s role in driving wool prices, and the AWI CEO then stood by his recent comments that wool prices “can only go up”. He also mentioned recent letters from international processors supporting AWI’s marketing and his concern about the China-US trade war. Mr Long asked: “So I just want to be clear here, when the price is going up, AWI is the reason for it, and when it is going down, it’s the other wool growing organisations in Australia’s fault? “What we’ve had for eight years, while we’ve been expediting our marketing projects in the Northern Hemisphere has increased and sustained growth of wool prices, to the point of 2100 cents,” Mr McCullough said. “Something has changed in the last couple of months, in the last month for that matter, it looks peculiar to me. Ms Hall told Sheep Central that WPA, in seeking a 1.5 percent wool levy, based on AWI’s own figures, was not calling for a cut in AWI’s marketing expenditure. “Because based on AWI’s figures in the WoolPoll voter information memorandum a 1.5pc levy produces the same amount of revenue as it had received in the last few years. Former Australian Wool Innovation director and past WoolPoll chair John Keniry also rejected Mr McCullough’s statements that grower bodies have contributed to recent lower wool prices and demand. 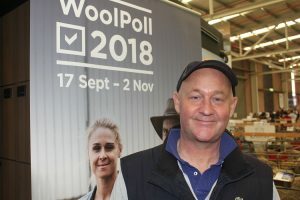 National Council of Wool Selling Brokers of Australia John Colley and leading market analyst Chris Wilcox said they had received no feedback that the WoolPoll levy debate had affected market demand or prices. “Some pre-sale discounting in forward levels being offered into China were being reported and this provided the inevitable feeble lead in to the start of auctions,” he said. “As the price moved so swiftly upward through the course of last season (up over 500 cents), the manufacturers were able to use a two to three-month average (length of supply chain) price to sell out the other end, so the top of the market price was no gauge as to the ability of the current price of wool being able to move all the way through to consumer,” he said. Mr Wilcox said it must be remembered that wool prices have come back in the last three weeks, but they had also increased in May and June this year. Mr Wilcox said the price increases were more driven by supply concerns and now issues on the demand-side were starting to come through a bit more. “I think particularly in China, the Chinese economy, the economic growth in China last quarter was the slowest we’ve seen since the Global Financial Crisis. “And that doesn’t seem to have much of anything to do with the China-US trade war; it’s got everything to do with the Chinese Government reigning in credit,” he said. He has had no feedback that Australian wool politics or discussion around a lower AWI wool levy was having a negative impact on wool prices. “I don’t think the Chinese are focusing on those others issues from what I understand. “It’s certainly not in the feedback that I’ve got,” he said. He said any reduction in wool marketing might be an issue in the long-term, but immediately it was about market dynamics. “Initially it (Chinese concern) was all about supply and the drought, they’re still concerned about that, now they are concerned about the domestic side and the demand conditions within China. Mr Wilcox said higher wool prices had led to the inevitable substitution by some processors of wool with other fibres. He said the industry also had to recognise that production of wool 18.5 microns and finer has increased this year, with a lot of hunger-fine wool of lower specifications. “Then there is obviously the nervousness and confidence levels, in that everyone is unsure about what the China-US trade war actually really means for the wool industry,” he said. “Lots of people throw darts on the board, but the reality is that we must remember that China is a Communist country and if Beijing says that ‘Australia is an ally of US, we don’t want you to buy wool or we want you to reduce your support’, they will. “But that’s not happening, that’s not the reason,” Mr Colley said. “It’s not a real price rise until the price is passed all the way down to the consumer in a finished garment, and that’s still a work in progress. He said in his conversations with Italian and Chinese wool industry people in the last 24 hours about market conditions and supply, any likely impact of the Australian WoolPoll levy debate wasn’t raised. Mecardo principal Robert Herrmann said on 17 August this year the Australian wool market peaked with an Eastern Market Indicator of 2116 c/kg, following Mr McCullough’s announcement January 17 announcement that the market can only go up, it can’t go down. “So since 11 August, the market has fallen 12 percent to (an EMI of) 1874 cents last week. “I don’t see that as anything sensational, I don’t see it as a disaster or the beginning of the end or anything like that,” he said. “I think some growers who have been passing in huge amounts of wool in these last two weeks are perhaps putting their finger to the wind. “But the interesting things is if you use AWI’s numbers (in the 2017-18 annual report), the average EMI they are working with is 1650 cents for next year (2018-19) – that’s a further 12 percent fall on where we are now and a 24pc fall from the peak on the 17th of August,” Mr Herrmann said. He said up until last week Australian growers had this season sold 6356 fewer bales per week than in the previous season. The average number of bales sold per week last season was 39,231, the weekly average sold in the 2018-19 season to date has been 33,113, and the year-on-year difference is a 26,000 less or 6356 bales per week. “If the supply is back by that amount and the market ends up averaging 24pc lower than where it was at the peak at the 17th of August, then that is a serious market correction and it’s why I discount it (AWI’s 1650 cent EMI) – I don’t think that’s possible. “I think in these circumstance that would be too extreme,” Mr Herrmann said. Mr Herrmann said on a practical analysis of the market, a 1650c/kg EMI average for 2018-19 would be “a shock to everybody”. He said the market has steadied today, but the pass-in rate is still in double digits, and last week it was 23.6pc. And now we wait to see if the Australian wool growers have had the courage to vote zero wool tax. David Mackenzie — It’s not a statement, it’s a diatribe for self-preservation. What a load of twaddle. I strongly object to contributing to these compulsory unions. Everybody is guilty of making at least one silly statement in their lives and some of us are guilty more than once. Perhaps Mr McCullough has excelled himself with his commentary on the recent downturn in wool prices.